His strong will and devotion to the Jedi order is only matched by his connection to the force. Though young, his potential and skill will pave his future as a great Jedi in the Order. Borned on the distant and mysterious world of Roon, Kero Zen left the planet at the age of 5, giving him little memories of the landscape, or the life on Roon itself. He did kept in memory the magnificent oceans of crystal, emerald-colored water, aswell as the odd feeling that those views would fill young Zen with : disgust and mistrust. Uncomfortable on the planet’s surface – or the life style of the people – Kero would simply wish to be swept away, to higher-end technology places such as Coreillia or passive wolrd like Naboo. Often at disgreement with his mother, who would refuse the galaxy’s credits to stay on Roon, a gap would grew between them. Roon was often blasted by suddent and unpredicatble storms of impressive storms, which would tear apart mostly anything in its path. At his early 5, Kero witnessed the horors that the wonder-world of Roon had to offer to its inhabitants : a deadly storm ravaged three nearby cities, climbing the casualities up over the hundred, and injuring a few tens aswell. The young child was caught by the storm during market visits with his father, when a shredded roof durastell would clean cut Kero’s right hand, which then left a scar – a milestone of his Roonan heritage – as he went flying through the havok, knocking his head hard on a wall. Through the chaos and pain that the storm inflicted, many helpers came to scalvage – perhaps the reasons his mother was so proud of Roon – and reconstruct the demolished cities. Since storms where quite ‘usual’ on Roon, leaving it for another world would have meen abandoning her people while in needs. This storm, though, was of a much greater scale than most, and had even alarmed the Jedi Council, which sent newly entitled Jedi Knight help the Roonans. Using the Force and his insight, the Cerean Jedi would eventually stumble on an inconcious Kero, picking him up, and out of the torned bulding, was halted by an apparently scared man. You found him, he said. The Jedi nodded to the man, knowing by his feelings that it must have been his father. He then begged the Jedi to help, as no doctors were available in the city yet. Knowing they may die if nothing was done, he also requested the Knight take them, Kero and his mother, with him. Informing him of his limited space on his starship, the man then questioned himself, and searched his feeling. Take the boy, his mother would have wished that, did he said with a sorrow-filed voice. After the work done on Roon, Jedi Knight Davro Rivir had taken young Kero Zen into Jedi custody, back to the Temple. The young human was treated for his wounds and caumotion during the storm. Davro would go see his bacta tank everyday, until he came out, brand new. The Council would visit the children themselves, as Masters Shimi Zaki and Axem Keigoku would sense the Force flow through the youngster, he was initiated in the Jedi ways, and put under Rivir’s tutelage as a Padawan soon after. Still under going his training, Kero is one strong light among the Jedi Order. While he opened his mind to the future and the Force, he still bares marks of the past. 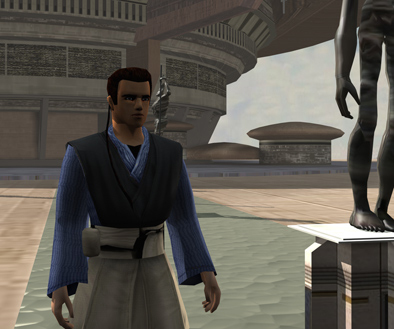 Hidden by a leather glove, a deep scar of Roon’s storms would remind him of his birthplace, but it is when he looks at the wide halls of the Jedi Temple that he remembers Home.